Most species of cranes sleep at night standing on the ground. They generally prefer to stand in shallow water, often on one leg, with their heads and necks tucked on or under one of their shoulders. In the breeding season cranes will sleep at or near to their nests so they can guard their eggs or chicks. In the non-breeding season most cranes roost in flocks for safety at traditional roosting sites. While cranes sometimes roost on dry ground, they prefer standing in shallow water that doesn't come above their heels. They also like the area to be free of trees or other cover for about 100 yards all round them. This helps the cranes to watch for predators. 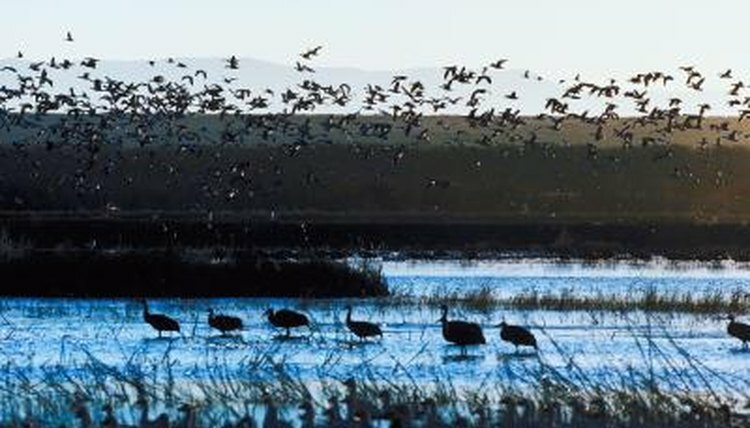 When they roost in flocks, the birds stand at pecking distance from each other. Late arrivals may have to roost where the water is too deep or too shallow, or where undergrowth blocks their view of predators. Cranes can sleep standing on both legs, but they appear to prefer standing on one leg and alternating legs throughout the night. This may help them to keep warm and rest their leg muscles. They often tuck their heads under their wings or sometimes their necks just droop as they go to sleep. There are two species of cranes -- gray and black crowned cranes -- that are able to roost in trees. They have a long hind toe that allows them to perch when they sleep. Annenberg Learner Journey North: Whooping Crane What is Roosting?